A familiar resident of the world's temperate rainforest are numerous species of woodpeckers. In fact their unmistakable pecking can often be heard throughout the forest. Listed here are numerous facts and interesting information about this temperate rainforest animal including why it pecks trees, what it looks like, and where they live. This information is written for both kids and adults. Click here for a great selection of Amazon.com books about Woodpeckers. There are more than 180 species of woodpeckers living throughout the earth. Their preferred habitats are areas with plenty of trees such as temperate rainforest. There are a few species of woodpeckers that live in areas with little or no trees including deserts. In fact some species, such as the Ground Woodpecker, no longer live in trees or use them to obtain food at all. This bird's diet consists mostly of insects, nuts, sap, and fruit. They are opportunistic and will feed on a wide range of foods when their primary food source cannot be obtained. 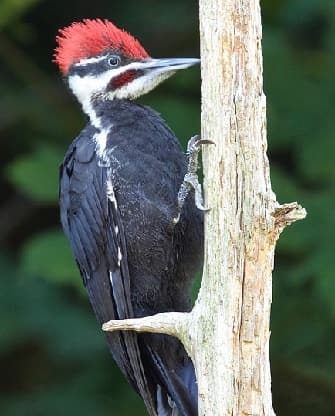 They mainly peck away at trees in order to get to the insects living in small crevices within the bark; some species also use this pecking as a form of communication with other woodpeckers. Mainly as a consequence of habitat destruction many species of woodpeckers are listed as endangered. The Ivory- billed Woodpecker and the Imperial Woodpecker are believed to have recently gone extinct; however there are some people who believe that this is not true. These birds generally nest in tree holes although there are regions where they nest in holes in the ground. Where you may think woodpeckers are hurting trees by hammering away at them with their sharp beaks they are in fact helping the trees stay healthy by preventing mass infestations. The plumage of the various species of this animal come in a wide range of colors including white, black, grey, brown, red, and green. This bird's strong beak is the perfect tool for hammering away at tree bark. All species of this animal have a long sticky tongue perfect for capturing insects. In order to prevent wood particles from being inhaled as they chip away at bark these animals generally have small nostrils covered by feathers. In order to protect their eyes from flying bark as they hammer away at tree bark these animals have a membrane that comes down over the eye. With two sharp claws a woodpecker's feet are well adapted for grabbing onto the side of trees as it searches for food. In fact these sharp claws along with short legs enable these animals to walk up the side of trees. At 7 grams (.015 pounds) the Bar-breasted Piculet is the smallest woodpecker in the world; the largest (if not extinct) is the Imperial Woodpecker, with a weight of 600 grams (1.3 pounds). In order to protect their brain while pounding away at bark these animals have special adaptations. These involve the position of the brain within the skull and the small size of the brain. The stiff tail feathers present in most woodpecker species help it support itself against trees as it hammers away in search of insects.